Sandy Koufax is sort of like the James Dean of baseball. Fans only got to enjoy his talent for a brief period of time, but the impression Koufax made is one that will be eternal. He was so dominant during his prime years that when most baseball experts are asked who they would choose to start one game, the answer is often this man. 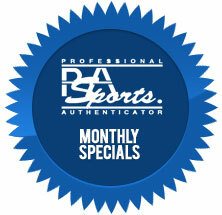 As a result of his remarkable rise, Koufax collectibles are amongst the most sought-after in the hobby. Baseball lost Koufax all too soon to an arm injury, but that doesn’t stop legions of collectors from pursuing his most popular cards. In the following article, we look at Koufax’s career in cardboard. 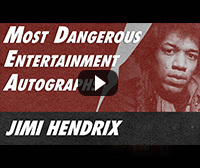 Each year, PSA/DNA takes a look back at the most dangerous autographs in the world of sports, history and entertainment. Like most years, the iconic autographs can be found on the list like those of Babe Ruth, Elvis Presley and John F. Kennedy. Autographs like these are the staples of the hobby and, unfortunately, they are often forged due to their market value. Each year, there is some movement on the list. Some names move within the rankings, some are added and some fall off the list for one reason or another. So, who made the list this time? Let’s take a look at The Most Dangerous Autographs of 2014. This 116-card set is filled with many of the most important basketball cards ever manufactured. It includes, amongst others, iconic cards like the 1948 Bowman George Mikan, the 1957 Topps Bill Russell, the 1961 Fleer Wilt Chamberlain and the 1986 Fleer Michael Jordan...all the rookie card staples can be found in this set. The sheer dominance of this particular set is what makes it so impressive. With a GPA of 8.89, it is no wonder this multi-award winning set continues to take top honors each year. It is simply the best of the very best. Click here for a look. Sirius Sports Cards Auction #127 is in progress. There are over 1000+ lots for auction that will end, Thursday, February 19, 2015 at 11 PM EST using the 15 minute rule. Auction features 10,000 high-end lots spanning all sports and genres. A treasure trove of memorabilia from some of the biggest names in sports, entertainment, politics and American history sold for $2.65 million late Saturday night in the Goldin Auctions 2015 Winter Auction at www.GoldinAuctions.com. Value aside, which of the following is your favorite mainstream Sandy Koufax card?